In his third installment, Nazemroaya removes the U.S./NATO fig leaf that attempts to cover the cynical machinations of the pro-Israel Lobby and its objective of balkanizing African and Asian states, especially those whose populations are largely Muslim. Nazemroaya makes the essential point: “An attempt to separate the merging point of an Arab and African identity is underway.” The Voice of America has exposed the psychological aspects of its brutal intervention and hints at the mindset of the U.S./NATO Libyan pawns; several stories suggest that the “new” Libya will turn more toward its Arab identity than its African identity. While Muammar Qaddafi drove home to all Libyans that Libya, as its geography dictates, is an African country, Nazemroaya shows how this fact is not a policy objective shared by the U.S., NATO, Israel, or their Libyan allies. Finally, in this last of the four-part series, Nazemroaya shows the ultimate perfidy of the U.S./NATO Libyan allies, especially Mahmoud Jibril, in the pre-emptive strike against the Jamahirya Wealth Redistribution Project. The Libyan people are now fighting the world’s most powerful militaries to save their Jamahirya. No matter how many times NATO-inspired media lie to their publics, the lies will never become the truth. Hauntingly, Nazemroaya ends by telling us that the Libyan National Transitional Council has already recognized the Syrian National Council (SNC) as the legitimate government of Syria. Meanwhile, Dr. Ayman al-Zawahiri, now reputed to be the leader of Al Qaeda and reportedly rewarded with U.S. citizenship after fighting for the C.I.A. in Bosnia, just called for the people of Algeria to oust their President. President Obama’s policy of flying drones and dropping bombs over Africa, and invading the Continent with U.S. troops, means that any country that resists an AFRICOM base, as Colonel Qaddafi’s wife tells us he did, or expects to exercise its right of self-determination, can expect the kind of treatment we are witnessing now in Libya. We, in the U.S., must resist these policies for ourselves and and on behalf of the Africans who deserve better than this from the United States of America. Cynthia McKinney, 25 October 2011. Cynthia McKinney is a former U.S. Congresswoman who served in two different Georgia federal dictricts in the U.S. House of Representatives from 1993 to 2003 and from 2005 to 2007 as a member of the U.S. Democratic Party. She was also the U.S. Green Party presidential candidate in 2008. While in the U.S. Congress she served in the U.S. Banking and Finance Committee, the U.S. National Security Committee (later renamed the U.S. Armed Services Committee), and the U.S. Foreign Affairs Committee (later renamed the U.S. International Relations Committee). She also served in the U.S. International Relations subcommittee on International Operations and Human Rights. McKinney has conducted two fact-finding missions in Libya and also recently finished a nationwide speaking tour in the United States sponsored by the ANSWER Coalition about the NATO bombing campaign in Libya. Terrorists not only fight for Washington on the ground, they also act as frontmen for regime change through so-called human rights organizations that promote democracy. Qaddafi had many grand plans. He wanted to create a South Atlantic Treaty Organization to protect Africa and Latin America. He advocated for a gold dinar standard as the currency of Muslim countries. Many of his plans were also of a pan-African nature. This included the formation of a United States of Africa. Colonel Qaddafi started the Great Man-Made River, which consisted in a massive project to transform the Sahara Desert and reverse the desertification of Africa. The Great Man-Made River with its irrigation plans was also intended to support the agricultural sector in other parts of Africa. This project was a military target of NATO bombings. Without just cause, NATO’s bombing campaign was intent upon destroying the Great Man-Made River. His crowning achievement would have been the creation of the United States of Africa. The supranational entity would have been created through the African Investment Bank, the African Monetary Fund, and finally the African Central Bank. These institutions were all viewed with animosity by the European Union, United States, International Monetary Fund (IMF), and World Bank. Qaddafi wanted all the people of Libya to have direct access to the nation’s wealth. He was also aware of the deep rooted corruption that plagued the ranks of the Libyan government. This was one of the reasons why he wanted to apply a model of political anarchy in Libya through progressive steps. He was talking about both these project for a few years. On the other hand, the Wealth Redistribution Project, along with the establishment of an anarchist political system, was viewed as a very serious threat by the U.S., the E.U., and a group of corrupt Libyan officials. If successful, the reforms could have created political unrest amongst many domestic populations around the world. Internally, many Libyan officials were working to delay the project. This included reaching out to external powers to intervene in Libya to stop Qaddafi and his projects. Amongst the Libyan officials that were heavily opposed to this project and viewed it with horror was Mahmoud Jibril. Jibril was put into place by Saif Al-Islam Qaddafi. Because of strong influence and advice from the U.S. and the E.U., Saif Al-Islam selected Jibril to transform the Libyan economy and impose a wave of neo-liberal economic reforms that would open the Libyan market. Jibril became the head of two bodies in the Libyan Arab Jamahiriya, the National Planning Council of Libya and National Economic Development Board of Libya. While the National Economic Development Board was a regular ministry, the National Planning Council would actually put Jibril in a government position above that of the Office of the General-Secretary of the People’s Committee of Libya (which is the equivalent of the post of a prime minister). Jibril actually became one of the forces that opened the doors of privatization and poverty in Libya. About six months before the conflict erupted in Libya, Mahmoud Jibiril actually met with Bernard-Henri Lévy in Australia to discuss forming the Transitional Council and deposing Colonel Qaddafi. He described Qaddafi’s Wealth Redistribution Project as “crazy” in minutes and documents from the National Economic Development Board of the Libyan Arab Jamahiriya. Jibril strongly believed that the Libyan masses were not fit to govern themselves and that an elite should always control the fate and wealth of any nation. What Jibril wanted to do is downsize the Libyan government and layoff a large segment of the public sector, but in exchange increase government regulations in Libya. He would also always cite Singapore as the perfect example of a neo-liberal state. While in Singapore, which he regularly visited, it is likely that he also meet with Bernard-Henri Lévy. When the problems erupted in Benghazi, Mahmoud Jibril immediately went to Cairo, Egypt. He told his colleagues that he would be back in Tripoli soon, but he had no intention of returning. In reality, he went to Cairo to meet the leaders of the Syrian National Council and Lévy. They were all waiting for him inside Cairo to coordinate the events in Libya and Syria. This is one of the reasons that the Transitional Council has recognized the Syrian National Council as the legitimate government of Syria. Do Not Pity the Dead, Pity the Living! Muammar Qaddafi is now dead. He was murdered in his hometown of Sirte. He stood his ground until the end like he said he would. The Transitional Council, which vowed to take him to court had him murdered. He even reminded the men who beat him, anally raped him, mocked him, and finally murdered him that they were not following the laws of Islam about respectful treatment of prisoners. NATO played a central role and oversaw the whole event. The murder was systematic, because after Qaddafi was murdered his son and several other Libyan leaders were killed too. Colonel Qaddafi’s death marks a historic milestone for Libya. An old era has ended in Libya and a new chapter begins. Libya will not become a new paradise like the Transitional Council says. In many cases the living will envy the dead, because of men like Mahmoud Jibril, Ali Tarhouni, and Sliman Bouchuiguir. Mahmoud Jibril is a mere opportunist. The man had no problems being a government official under the late Qaddafi. He never complained about human rights or a lack of democracy. He was the prime minister of the Transitional Council of Libya until a few days after the savage murder of Colonel Qaddafi. The opposition of Jibril to the late Qaddafi’s Wealth Redistribution Project and his elitist attitude are amongst the reasons he conspired against Qaddafi and helped form the Transitional Council. Is this ex-regime official, who has always been an open supporter of the Arab dictators in the Persian Gulf, really a representative and champion of the people? How about his colleagues in the Transitional Council who negotiated oil contracts with NATO member states, even before they held any so-called government positions in the Transitional Council? Mahdi Darius Nazemroaya is a Sociologist and Research Associate of the Centre for Research on Globalization (CRG), Montréal. He specializes on the Middle East and Central Asia. He was on the ground in Libya for over two months and was also a Special Correspondent for Flashpoints, which is an investigative news program carried on numerous stations in the United States and based in Berkeley, California. Nazemroaya has been releasing these articles about Libya in conjunction with aired discussions (now archived) with Cynthia McKinney on Freedom Now, a show aired on Saturdays on KPFK, Los Angeles, California. Henri Pierre Habib, Politics and Government of Revolutionary Libya (Montmagny, Québec: Le Cercle de Livre de France Ltée, 1975), p.1. Christopher M. Blanchard and James Zanotti, “Libya Christopher M. Blanchard and James Zanotti, “Libya: Background and U.S. Relations,” Congressional Research Service, February 18, 2011, p.22. Private discussions with Mahmoud Jiribil’s co-workers inside and outside of Libya. Internal private documents from the National Economic Development Board of the Libyan Arab Jamahiriya. These trials will be pursued on an international basis. Together, our Earth allies and our Agarthan cousins have already arrested tens of thousands of individuals. These persons and their higher-placed colleagues will be tried within regions, and it will be the responsibility of each region to conduct their own hearings and to sentence these individuals if and when they are convicted of crimes. We recently set up purpose-built holographic environments to house those convicted until such time as the migrations to the metamorphosis Light chambers commence. Your limited-consciousness reality produced essentially two categories of people: the haves and the have-nots. The disparity between these groups created a wide variety of karmic patterning and bonds between many of you, and the key to releasing all this is simply Love and forgiveness. Generations of lives were played out in a hugely inventive and complex epic, written by master playwrights: you! But it is time now to end these dramas. Ahead of you lies the shift into full consciousness. In this mode of being, you can easily recall each second of any life you choose to relive. In so doing, you can see how you entwined each other in various dramas, lasting years, decades, or even lifetimes. The purpose of all this was to go through experiences that would build up your store of wisdom, like choosing to learn certain ‘lessons’ either collectively or individually. Now you are to discover the reasons behind these experiences. Use this knowledge, as we do, to broaden your perspective of what makes a person ‘human.’ You can explore the full gamut of ‘the human experience’ which we have all, at one time or another, lived through. Here you will find both sadness and humor, allowing your dearly won wisdom to come into its own as you examine other planetary cultures that are in similar states of limited consciousness. Our exosociologists deeply value their time on your world, and you too, by virtue of your extensive experience, will become most wise and sought-after Souls. The new political and economic system forged by our Earth allies and our Agarthan cousins is very close to manifesting. The last secret-government underground bases are closed, and we evacuated many more thousands of dark cabal underlings from them. Our sights now turn to the major conspirators. Here we expect to be able to force the resignations of the dark’s illegal regimes and so this operation is ready to begin in earnest. Our Earth allies, under the supervision and divine direction of your Ascended masters, possess a legal standing backed by allied military divisions that use their moral and legal authority to compel the stand down of the military forces of several nations pledged to the services of the dark cabal. Happily, these forces are inclining increasingly to the Light, and this changing-sides is reaching a point where it becomes possible to leverage the remaining dark governments from office. Once this situation is fully accepted by the dark, deliveries, followed by new governance and announcements, become possible. Blessings! We are your Ascended Masters! Your planet is in the final stages of moving herself into full consciousness. Her Spiritual Hierarchy has delayed the last few moves that herald her surface makeover. However, feeling deeply Gaia‘s desire to raise her consciousness, we Ascended Masters have accelerated the procedures contributing to the transformation of humanity, including the basic operating protocols of your financial and governmental structures. What needs to take place now is a wholesale change of perception in your social philosophies: in essence, this involves moving from the strictly material toward a more spiritual worldview. What is needed is a global society based on mutual respect and the honoring of all. The separations and hatreds that have long characterized Earth’s societies are no longer appropriate; it is time to acknowledge your ‘oneness’ with each other and create societal structures rooted in these beliefs. These new structures are to manifest when the changes we have been discussing become reality. Our associates, with great fortitude, have created the conditions that will make such a world possible. Your anticipation of these new realities can be seen in the numerous governmental changes and public manifestos of what is swiftly becoming a global movement for peace, justice, and prosperity. Implicit in this movement is a universal acceptance of each other. You are proclaiming yourselves to be a united and free humanity, and we take this global movement as proof of what you truly aspire to. St Germaine’s world trust and those facilities created by our associates are waiting to be born. And so comes the time to bring these things into the light of day and begin our joint march toward a new fully conscious reality! We have asked our associates to finish whatever details remain outstanding and to get the prosperity out to the people. It is extremely important that your present form of governance be replaced as the dark-oriented regimes are the major obstacle preventing the long-promised funds from being delivered. On top of that, disclosure and all that that entails needs to be announced as soon as possible. These issues have lain around unresolved for far too long. Now, Gaia desires to go ahead with her transformation, and our timetable has also reached the point where it can no longer accommodate any more delays. And so we have sent out a single communiqu� to both our Agarthan friends and the Galactic Federation, recommending them to act on our behalf and to do so now! It is time to set aside protocol and let our beloved planet and her peoples be free! Commander Korton Pleidian we are busy finishing up arrests and preliminary announcement matters. We recommend that all light workers focus clearly on all projects they have in mind and how they wish to implement for group meetings that will manifest in the near future. Yes many people will be surprised to be arrested after the Nesara announcements as well. Keep the faith and know justice will prevail for all! Commander Solar Arcturians We will be setting up regional boards to implement Galactic Society principles regarding your healing center applications! Humanities present groups in healing will be invited to contribute to new applications and training strategies. Introductory explanations will be forth coming at your center opening information events. Ja-Lai-La Creation Lightship I am thrilled you asked me to talk we have been busy allocating teams to work with the Arcturians in your healing centers. Also we are busy forming curriculum for your engineering sector for re-education in this field and other science departments. These courses will be offered through your centers and Galactic University locations. Both locations will be offered in alignment with mother earths energy grid with the intent of stabilizing her cleansing and ascension process. We will also introduce a non time collective philosophy to entice humanity away from the limiting programming of the light of the darkness Dark ET agenda. This will meld well with Anastasias space of love training for individuals and families meant to strengthen humanities societies with universal spiritual principles forgotten for far too long. Commander Syran Sirian We are ecstatic about the courage of all peoples participating in the Occupy movement on your planet presently and ask that they also open to the possibility of our friendly support in your skies and planet. We know that the majority of humanity believe and wish to greet us so perhaps we can make a fly over to many of the occupy events. Invite only 100% Creator Christ light beings and just keep your eyes to the skies! We hear your request for protection for all Occupy participants! Commander Roomus Lyran Please know that all the unknown financial events globally will be properly supported with the Nesara reformations being implemented at this time. The bankers can no longer betray there citizens with fraudulent mechanisms many are becoming privy too. We bring our architectural and art strengths to share in your teaching facilities which I am sure many in those areas will enjoy. You will no longer have to destroy your planet in order to build living accommodations. Commander Teo Wingmakers Humanity will be surprised to learn of the time travel applications there government secret agencies have used for this planet and other planets in this galaxy. Know that the long dark knight for humanity has been declared over with obvious confirmation forth coming. We are anxious to show you our special technologies and locations for the advancement of humanities developments in the coming years. Advanced art and time sciences will be taught through our liaisons to prevent any further dark advancement in this galaxy again. Humanity need to understand there spiritual heritage and universal responsibilities through personal and regional sovereignty once again in detail. We will continue to encourage your website visitors to support your truth work. It’s a glass and steel cube. Next to a thruway. How heart wrenchingly touching. When I look at it, I become moved by so many intense emotions. The main one is boredom. Don’t get me wrong, I can appreciate a good cube when I see one. And that is one fine cube. But does it make me reflect on 9/11 and the state of humanity? Not really. It however does make me want to go downstairs to get the latest Iphone though. Anyways, the memorial features two intertwining paths representing the two infamous flights who took off at the Boston Logan Airport. The top of the cube depicts a “fractured sky” because the sky was never the same since 9/11. It is true. In the words of Peter Griffin: “9/11 changed everything, Brian. It changed EVERYTHING” Yes, even the sky is changed, it is now destroyed by terrorists. Here’s some nice comments from locals I’ve found on the internets. It is not the worst memorial I’ve ever saw, but it is painfully forgettable. This plaque was installed at the base of the KATYN statue in New Jersey, which directly faced the Twin Towers. 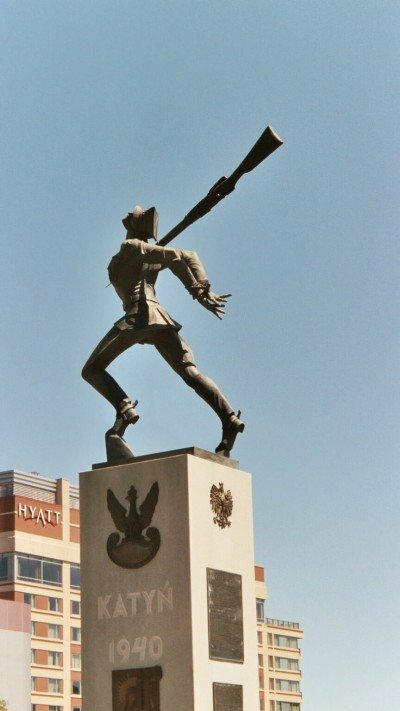 The statue (which is also depicted on the plaque), is of a wounded WWII soldier getting stabbed in the back…a little like America who got stabbed in the back on 911**cough**Bush did it **cough. In other words, this plaque would commemorate the planned and occult ritual that was 9/11 and the event is even likened to a sexual act. The woman is evidently not the Virgin Mary as the symbolism on and around her refer to the concept of female goddess who completes the solar deity. This is just sick, disgusting, awful, and I have no more adjectives for it so I’ll just spit on the computer screen. Is this ceremony telling us who’s behind 9/11? 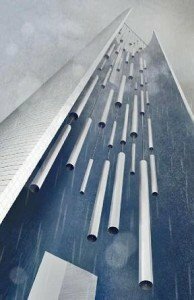 An interesting thing very few people know about is the “Oculus” artwork project, which was placed directly underneath the WTC in 1998. 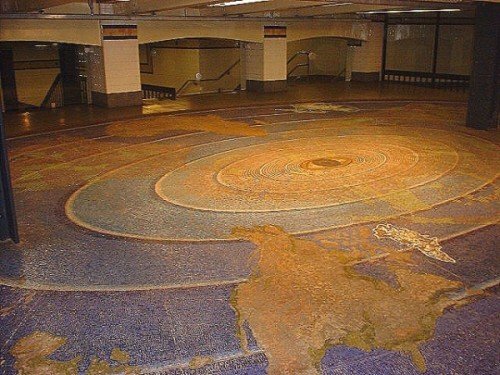 The centerpiece of the work is an elliptical glass and stone mosaic floor, with a micro mosaic eye at the center of an ultramarine vortex with the image of the City of New York woven into the picture. This All-Seeing Eye, placed right under the actual Ground Zero sends shockwaves around the world. 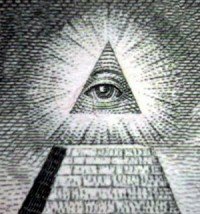 Those of you who know the myth of the eye of Horus, where Osiris experiences rebirth in the underworld, will surely find it interesting that this eye is located below ground level…in the “underworld”. 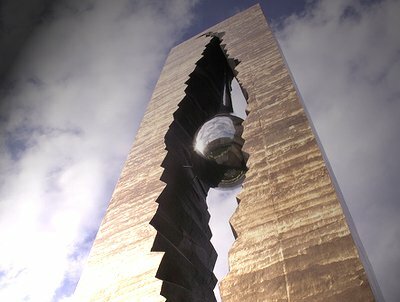 The monument comprises a 100-foot-tall bronze tower with a jagged split down the middle and a 40-foot-long stainless steel teardrop suspended in the gap. Thank you Putin and Bush for your struggle against terror. Now, here’s some comments from people I don’t know, taken from various articles, including NY Times’: “A Jersey City Teardrop for 9/11, Or a 10-Story Embarrassment?”. Those into symbolism might want to check into Horus, the Sky God, who was portrayed by ancient Egyptians as a Peregrine Falcon’s eye with a teardrop underneath it. Is this teardrop coming from the All-Seeing Eye in the sky? This memorial hasn’t been completed yet but it already has created more controversy than any other. The official story of 9/11 is that angry Islamic people “who hate our freedoms” have plotted this attack from a cave deep in Afghanistan, while eating hummus with their fingers. 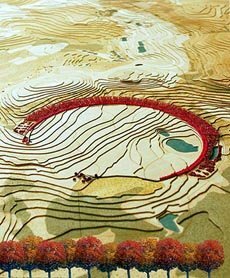 Let’s assume this is true… Would it make sense to create a huge memorial in the shape of the Muslim crescent? 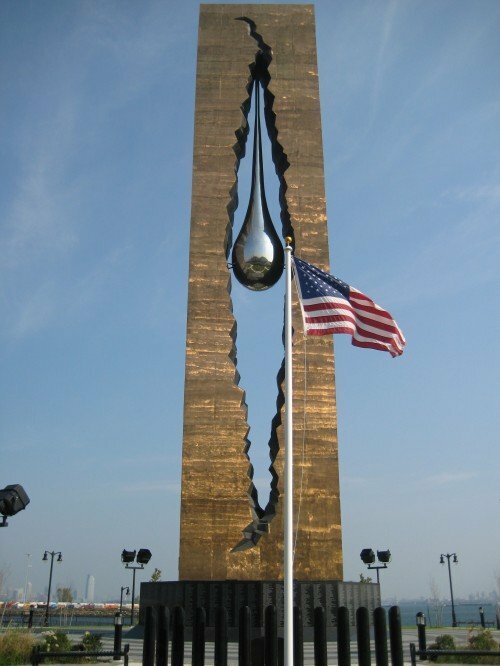 I mean, if the USA destroyed a building in Iran for no reason, would the Iranians build a huge memorial looking like the US flag? I don’t think so. Unless it was to burn it afterwards. 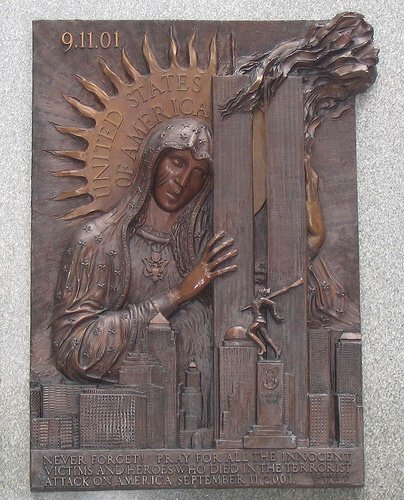 Well, if the government is consistent with its Al-Qaeda story, it should maybe try not to incorporate blatant Muslim symbolism in its memorials, unless they want to piss people off big time. And they did. The memorial managed to anger Christians, Muslims, Jews and miscellaneous at the same time. Maybe that’s the memorial’s goal: to unite all religions through hating it. 1. THE GIANT CRESCENT. 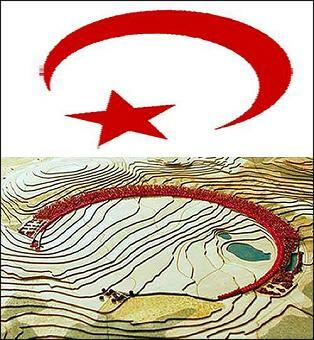 The centerpiece of the original “Crescent of Embrace” design was a giant red Islamic shaped crescent. Every particle of this original crescent design remains completely intact in the so-called redesign, which only added a few irrelevant trees. The giant crescent is still there. 2. IT POINTS TO MECCA. The giant crescent points to Mecca. A crescent that Muslims face into to face Mecca is called a “mihrab,” and is the central feature around which every mosque is built. The Flight 93 Memorial is on track to become the world’s largest mosque. 3. THE ISLAMIC SUNDIAL. The minaret-like Tower of Voices is a year-round accurate Islamic prayer-time sundial (one of many typical mosque features that are realized in the crescent design, all on the same epic scale as the half mile wide central crescent). 4. THE 44 BLOCKS. There are 44 glass blocks on the flight path, equaling the number of passengers, crew, AND terrorists. Intentional or not, these features are entirely unacceptable. This travesty must stop and investigations must begin. 1) We the undersigned call on our state and federal legislators to undertake their own thorough and independent investigations of the Flight 93 Memorial design. The truth must come out. 2) We ask that the crescent design be scrapped entirely and that it be replaced with a new design that is not tainted by Islamic or terrorist memorializing symbolism. 3) We demand a fitting and proper memorial that HONORS the brave men and women of Flight 93. Wow, talk about a bad idea. So, if you’ve read correctly, the terrorists are also honored in the memorial. That’s a great way to anger people. Here’s what some people said about the memorial and recent redesign. Alec Rawls has written a full book called “The Crescent of Betrayal” describing in detail the symbolism of the memorial. Here’s what he says on the “Tower of Voices”. The Tower of Voices…Scary name. “Every place where the terrorists are memorialized in the crescent design, they are placed in the symbolic Islamic heavens (the crescent and star parts of the design). Every place where the 40 heroes are memorialized, they are depicted as symbolically damned, cast out of the symbolic Islamic heavens. 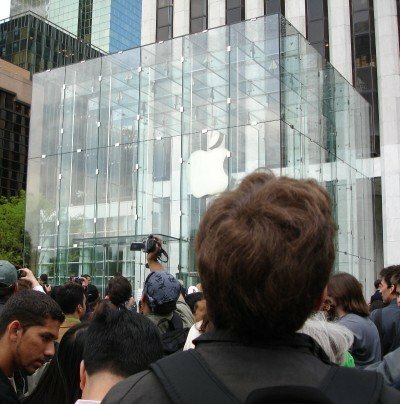 Many Muslims have also protested against the memorial, arguing that a symbol associated with Islam is used to remind the world of a terrorist act. They believe that the use of the crescent will only add to the resentment against Islam resulting from 9/11. So this concept managed to piss pretty much everybody off except Bob Saget who found it “amazing”. For this reason, the Crescent of Embrace takes #1. Oh, and they’ve recently changed its name to “Bowl of Embrace”. Nice. As you might have noticed, these memorials aren’t on this list simply because of their deficient looks, it is mostly due to their symbolism. 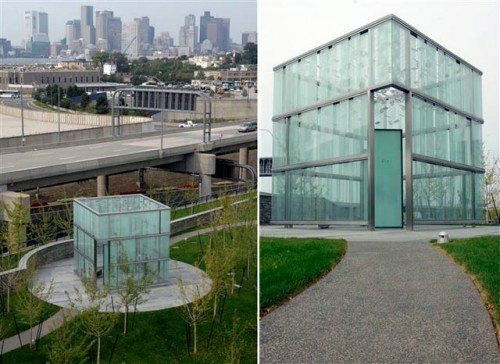 If something as honorable as a memorial dedicated to innocent victims manages to irritate regular people, it is because there’s something terribly wrong with it. 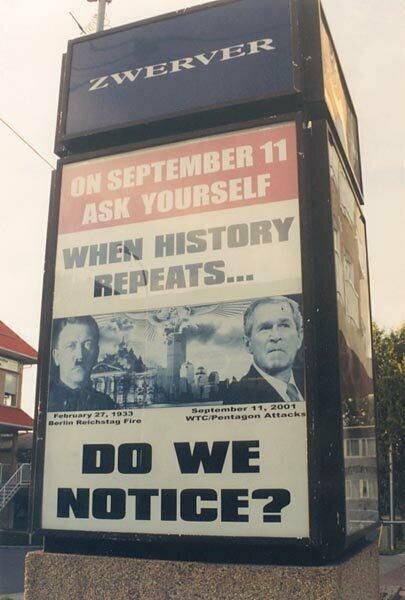 Furthermore, those who are convinced that 9/11 was an inside job will see in the more occult memorials a terribly sinister meaning. Is there a reason why they are planning to include the name of the “terrorists” on the Crescent memorial? Are they are considered heroes who sacrificed their lives for the 9/11 ritual? Enough about Jesus. Now listen to my economic policies! On October 24th, the Pope officially gave his support to Occupy Wall Street and, like Gorbachev, proposed a solution that goes EXACTLY at the opposite of the protester’s demands: an international organization regulating economy. In other words, a Central World Bank. In other other words, a New World Order. Thank you Vatican for your input. Jesus was indeed a big advocate of international banking. 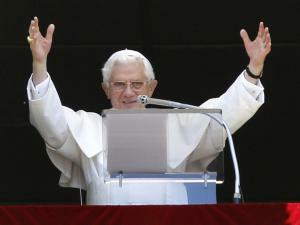 He also preached about a world financial system that would only benefit the elite. Yup, that’s what he did alright (sorry for the extreme sarcasm). Here’s an article about the Vatican pushing for the same international system as the Rockefellers and others. The Vatican called on Monday for an overhaul of the world’s financial systems, and again proposed establishment of a supranational authority to oversee the global economy, calling it necessary to bring more democratic and ethical principles to a marketplace run amok. The document is a reminder that the Catholic Church, without getting involved in policymaking, still seeks to shape its principles. “To function correctly the economy needs ethics; and not just of any kind, but one that is people-centered,” the document states, paraphrasing an encyclical that Pope Benedict XVI issued in 2009 calling for greater social responsibility in the economy. Politically conservative Catholics, meanwhile, hastened to assure their camp that the document does not carry the full force of church teaching, since it was produced by a Vatican office, not by the pope himself. And some dismissed the report as nothing new, or simply misinformed. In the past few years, a new kind of specialty TV channel has been inserted in regular programming: TV for toddlers. Networks such as BabyTV air shows that were devised for and aimed to children under two. Most parents who have watched these strange, hypnotic shows are amazed by how their babies are mesmerized by them. But one cannot help but ask: Is it healthy to place a baby, who is barely aware of its surroundings, in front of an 51″ plasma TV with CGI cartoon characters bouncing around in high definition and chanting strange things? Are these shows “educational” or mind-numbing hypnosis sessions scientifically devised to subliminally capture babies’ attention? No matter what’s the answer, a group of doctors agree that TV is simply not good for babies. If it already makes fully grown adults dumber, one can only imagine what TV does to baby with soft brains who don’t even have the motor functions to stand up straight. Here’s an article summing up a study by the Journal of Pediatrics. Children under age 2 should avoid watching TV as much as possible, according to a new policy statement from the nation’s largest group of pediatricians, who suggest the tots should play instead. The idea that TV programs are beneficial to the learning of children this young has not been proved, the American Academy of Pediatrics says. In addition, TV viewing may lead to sleep problems and a delayed use of speech in young kids, recent research suggests. Even merely having the TV on in the background may be less than optimal for a child’s development, the AAP says. Background television may distract from playtime activities that benefit children’s learning. And it may distract parents, preventing them from speaking and interacting with their kids, the AAP says. However, the recommendations run counter to what most parents actually do. About 90 percent of parents say their kids younger than 2 watch some type of media, according to a 2007 study. By the age of 3, nearly one-third of kids have a TV in their bedrooms. As a compromise, parents should come up with a strategy to manage TV viewing in their young children, the AAP says. Ideally, when kids younger than 2 watch TV, their parents should watch it with them. The new policy statement was released today (Oct. 18) here at the AAP National Conference & Exhibition. The policy statement specifically addresses the viewing of TV programs and does not comment on the potential benefits or risks of using phone applications, video games or other programs a child may encounter on a screen. The AAP first released guidelines on media use by young kids in 1999, concluding that media use by kids under 2 should be discouraged. Since then, a lot more research has been done on the subject. The AAP reviewed this research for its new policy statement and essentially came to the same conclusion. That’s not to say that kids can’t benefit from TV. Children older than 2 can improve their language and social skills by watching TV, some studies have shown. However, in order to gain a benefit from a TV program, kids need to be able to understand and pay attention to it. Young kids may lack the mental ability to comprehend what they are watching. In fact, two studies have found that, for kids 2 and under, watching programs such as “Sesame Street” may have a negative impact on language development, the AAP says. “There’s a great developmental digital divide,” Dr. Ari Brown, a pediatrician in Austin, Texas, and lead author of the new policy statement, said at a news conference. Studies show that children under 11/2 years old have the same reaction to a TV program regardless of whether it’s going forward or backward, Brown said. In contrast, older children prefer to watch the program forward. All in all, instead of spending time in front of the TV, young kids are likely better off spending that time engaged in unstructured play, which promotes creative thinking, problem solving and reasoning skills. Parent should be aware TV programs may affect their child’s development, even if the child cannot understand the program. They should turn the TV off if no one is watching it and try to watch their adult programs when the kids are not around, Brown said. If parents cannot play with their kids directly, even having the children play with toys by themselves can be beneficial, the AAP says. The AAP also recommends further research in this area to examine the long-term effects of early TV viewing on toddlers’ development. The new policy statement will be published in the November issue of the journal Pediatrics. In the article entitled Dumbing Down Society Pt I: Foods, Beverages and Meds, I wrote that fluoride was a toxic chemical that caused the deterioration of cognitive functions when ingested. In other words, swallowing fluoride makes you dumber. Despite the fact that some communities have recently managed to gather enough support to get their cities to stop water fluoridation (see Pinellas County in Florida), millions of people are still unaware of the dangers of fluoride and still consume great amounts of it. In this video, a dentist describes the brain numbing effects of fluoride when consumed in unhealthy doses.